Let versatile asparagus and kale grace Spring’s weeknight table in a refreshing soup or warm meal as they turn on the culinary spotlight. There’s no turning back once you discover the delicious, earthy flavors and multiple textures of these garden delights in a chilled soup and fuss-free irresistible quiche. Heat the chicken stock in a large sauce pot. Warm the olive oil in a sauté pan over medium heat. Sweat the leeks for 5 – 7 minutes until soft (do not let them color). Add the hot chicken stock, diced potato and a healthy pinch of salt. Bring to a boil and cook for 7 – 8 minutes. Add the asparagus slices and parsley leaves and boil at high heat until tender, about 5 minutes. Pour soup into a blender until half full. Carefully blend the soup until smooth. Season to taste with salt and pepper. Over a fine mesh sieve, strain soup over a large bowl. Repeat the same process until all the soup is blended and strained. Place the bowl over an ice bath to cool to maintain its bright, vibrant green color. When cooled, cover and refrigerate until ready to serve. In a small bowl combine softened goat cheese with chopped basil leaves. Mix until well-incorporated. Add a pinch of Kosher salt and fresh ground black pepper to taste. Set aside. Using a small melon baller sprayed with nonstick spray, scoop goat cheese dollops onto a parchment paper lined cookie tray. Place cheese tray in freezer to cool for a few minutes. 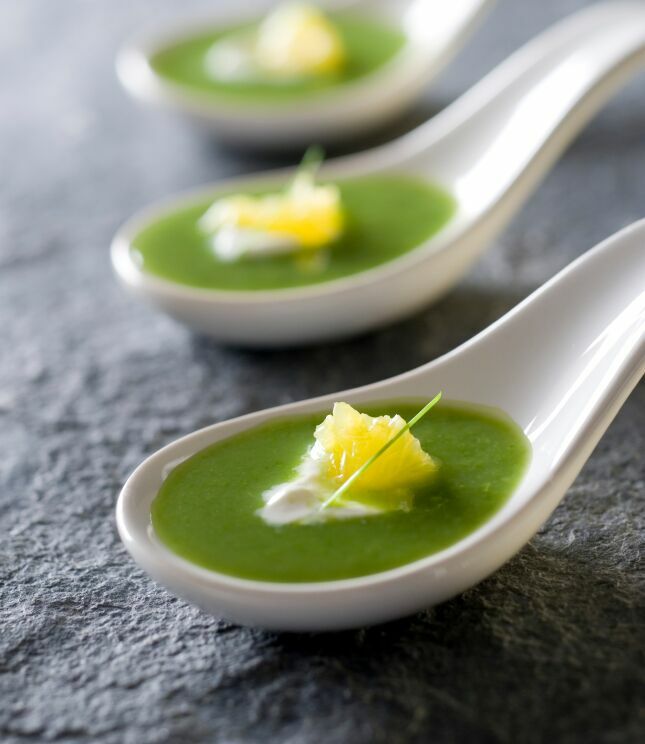 Gently ladle chilled soup into individual white spoons. Garnish each soup spoon with a chilled goat cheese ball and strand of fresh chopped chive. Drizzle each spoon with a touch of olive oil. Serve immediately. Serves 12.